I turned to the cookbook, La Cucina for tonight's meal. 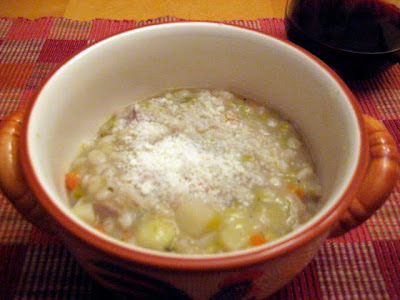 Barley Soup 1. Or Minestra Di Orzo 1. The cookbook numbers it's soup, for instance there are 5 Barley Soup recipes. This recipe comes from the Valle D' Aosta region. Heat the butter in a saucepan over low heat until melted. Add leeks and onion and cook until the leeks begins to soften. Add the potatoes and carrot and cook for about 10 minutes, then cover with boiling water. When the mixture returns to a boil, add the barley and thyme. Let cook, uncovered, over medium heat for 1 hour, until the barley is tender. Season with salt and pepper. Up to this point you have a great vegetarian soup... but I still have the leftovers from the roast from Christmas in the freezer. I cut the meat into small pieces and added them to the soup. Voila - Beef Barley Soup! My husband just told me that is 25 degrees in New Orleans! Right now we are at 14 degrees... time to make some soup! this soup looks delicious....actually your whole site is great and I am following you. Visit me when you have a chance pls. I am very new to the world of food blogging.